by Chris Woodford. Last updated: April 18, 2018. Photo: The US Navy on a helicopter mission in Iraq in 2002, seen through night vision goggles. Photo by Lt. Troy Wilcox courtesy of US Navy. 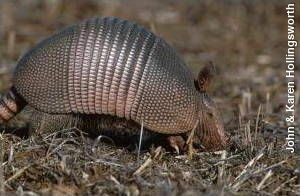 Photo: The armadillo is generally a creature of the night. Photo by John and Karen Hollingsworth courtesy of US Fish and Wildlife Service. Photo: A Land Warrior PVS-14 night vision device. Photo by courtesy of US Army. Imagine your job is to invent a pair of eyeglasses that will help people see at night. It's obvious what you have to do. Light rays will travel into the glasses at the front, so you must capture them somehow, boost them in strength, and then fire them into the person's eyes. But how can you capture and boost light? Binoculars, telescopes, and even ordinary eyeglasses will bring light to a focus, but they don't make it any brighter. It's easy to invent a pair of glasses that make things dimmer: you just coat the lenses with something that absorbs some of the light—and that's how sunglasses work. But glasses that make things brighter are a tall order. 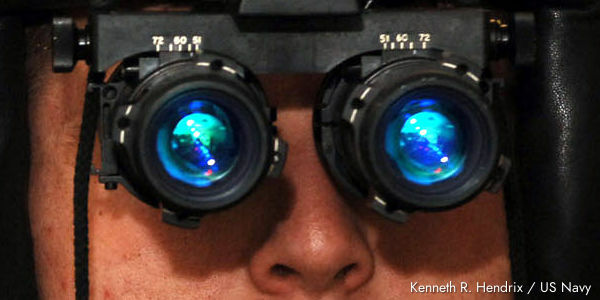 Photo: Night vision goggles are an extension of your own vision. Photo by Kenneth R. Hendrix courtesy of US Navy. Electricity, on the other hand, is very easy to boost in strength. People have invented all sorts of electrical devices that take in a small electric current (flow of electricity) at one end and produce a bigger flow at the other. Something that does this is called an amplifier. A hearing aid, for example, uses a tiny electronic component called a transistor to amplify sounds (increase their volume) captured by a microphone so that someone hard of hearing can listen to them more easily. An electric guitar uses a much more powerful amplifier to turn the plucking sounds the strings make into sounds that can fill a stadium. So here's a way to invent goggles that boost light. What if we turn the light into electricity, boost the electricity, and then turn the boosted electricity back into light? That should make the light much brighter so we can see even at night. This unlikely sounding trick really does work—and it's how night vision goggles help us to see. Dim light from a night scene enters the lens at the front. The light is made of photons (particles of light) of all colors. As the photons enter the goggles, they strike a light-sensitive surface called a photocathode. It's a bit like a very precise solar panel: it's job is to convert photons into electrons (the tiny, subatomic particles that carry electricity round a circuit). The electrons are amplified by a photomultiplier, a kind of photoelectric cell. Each electron entering the photomultiplier results in many more electrons leaving it. The electrons leaving the photomultiplier hit a phosphor screen, similar to the screen in an old-fashioned television. As the electrons hit the phosphor, they create tiny flashes of light. Since there are many more photons than originally entered the goggles, the screen makes a much brighter version of the original scene. Photo: Artwork by explainthatstuff.com based on the photo up above, courtesy of US Army. Please note that this is a generalized illustration of what happens in night vision goggles; it doesn't represent precisely how the Land Warrior device shown in the photo actually works. Artwork: From US Patent 5,737,131: Night vision monocular by Gary L. Palmer, ITT Corporation, April 7, 1998. Courtesy of US Patent and Trademark Office (with colors added for clarity). In reality, as you can see from this patent illustration of a Land Warrior-type night vision monocular designed by Gary Palmer of ITT, the image-boosting photocathode and photomultiplier—the image intensifier components—represent only the central part of a more complex (but still relatively conventional) optical system. Don't be confused by all the details; I've colored and highlighted a few of the key bits to show how everything fits together. Using the numbers from the artwork and working from left to right: 40 is the objective lens (the lens closest to the object you're looking at); 42 is essentially a focusing mechanism; 50 is the image intensifier unit (corresponding to parts 2,3, and 4 from my simplified artwork above); 54 is a collimator that narrows and aligns the light rays passing through it; 58 and 62 are mirrors; 14 is the eyepiece. At the bottom, 78 is a voltage regulator and 81 is the battery pack. 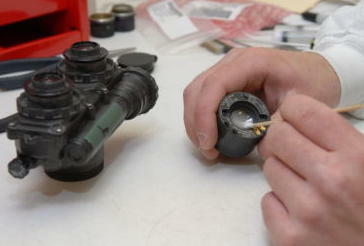 Photo: Night-vision goggles have to be kept clean just like ordinary eyeglasses. Here, an electronics worker is cleaning out the photomultiplier (also called an image intensification tube). Photo by Tracey Condi courtesy of U.S. Army. What if there really is no light? Night vision goggles like the ones described above are sometimes called image intensifiers, because they take the tiny amount of light that's available in near darkness and boost it enough for our eyes to see. But sometimes there just isn't enough light to do this—and image intensifier goggles simply don't work. Suppose, for example, you're a firefighter trying to see if there's anyone trapped inside a smoke-filled building, An image intensifier would be as useless as your own eyes. Photo: Powerful, thermal-imaging cameras are really helpful to firefighters working in places where dense smoke limits visibility. Photo by Jo Wilbourn courtesy of U.S. Navy. 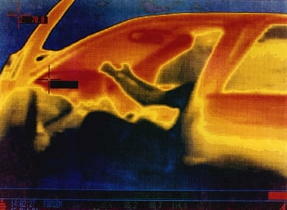 Photo: An infrared thermal image (thermogram) of a car parked in sunlight: here different colors show different temperatures, with red and yellow hottest and blue coldest. You can see how the inside of the car and its metal bodywork are far hotter than the air outside it. Photo courtesy of US Department of Energy. The alternative is to use what's called thermal imaging. Instead of looking for the light that objects reflect, we look for the heat they give off instead. Generally, living things moving around in the darkness are going to be hotter than their surroundings; that goes for vehicles and machines too. Hot objects give off infrared radiation, which is a similar kind of energy to light but with a slightly longer wavelength (lower frequency). It's relatively easy to make a camera that picks up infrared radiation and converts it into visible light: it works like a digital camera except that the image detector chip (either a charge-coupled device (CCD) or a CMOS image sensor) responds to infrared instead of visible light; it still produces a visible image on a screen the same way as an ordinary digital camera. Other types of thermal imaging cameras use different colors to indicate objects of different temperature—and they're commonly used to show things like the heat loss from badly insulated buildings. How does a thermal image sensor work? Rescue workers and firefighters don't always have free hands to carry things, so not all thermal imaging cameras are handheld. Here's a handy helmet-mounted camera designed especially for those sorts of extreme situations. I've colored most of the main components to make it slightly easier to follow. The infrared camera unit (gray) mounted on the cap of the helmet (yellow) captures a thermal image, which circuits inside (green) decode, amplify, and convert into a form that can drive a traditional display (red). A bendy, articulated cable (blue) carries electrical signals from these circuits to the display, which (in this example) is positioned in front of the wearer's right eye. Artworks: A thermal camera with helmet mounting. Left: Front view showing how the camera and its eyepiece are attached to the helmet; Right: Exploded view. US Patent 7,369,174: Helmet-mounted thermal imaging system by Jules Olita et al, Sage Technologies, May 6, 2008, courtesy of US Patent and Trademark Office. 12 and 12A. Protective helmet and cap (yellow). 18. Case for image sensor unit (gray). 18A. Opening for camera lens and image sensor (orange). 22. Monocular eyepiece display (red). 24. Bendy arm carrying cables from to image sensor to display (light blue). 40 and 42. Imaging processing and display circuit boards (green). Infrared energy: NASA has a good simple explanation of infrared light, including the various kinds of thermal imaging and their uses in astronomy. Night Vision: The Art of Urban Exploration by Troy Paiva. San Francisco, California: Chronicle Books, 2008. A book of unusual photos taken with night vision equipment. Selected papers on night vision technology by R. Hradaynath (ed). SPIE Optical Engineering Press, 2001. A collection of over 100 key academic papers. The Taliban Have Gone High-Tech. That Poses a Dilemma for the U.S by Thomas Gibbons-Neff and Jawad Sukhany. The New York Times, April 1, 2018. Night vision can give troops a military advantage, but not if it falls into "enemy" hands. Night Vision for Self-Driving Cars by Mark Harris. IEEE Spectrum, 18 October 2017. How infrared sensors could help self-driving cars to navigate at night. A Sharper Picture for Night Vision by John R. Quain. The New York Times. December 5, 2014. Could night vision windshields and heads-up displays help motorists negotiate their way down darkened highways? Graphene Gives You Infrared Vision in a Contact Lens by Dexter Johnson. IEEE Spectrum. March 17, 2014. Graphene can detect infrared radiation, but can't produce much of a current when it does so. This article explores the extra tricks needed to make graphene work in night vision equipment. Night vision scopes see daylight by Daniel Emery. BBC News, 17 November 2009. Latest developments in military night vision equipment, including a short video showing what things look like through night vision. Here's a selection of patents that will give you a deeper technical insight. US Patent 3,454,773: Binocular night telescope with single image tube by Henricus Wilhelmus Bulthuis, Optische Ind De Oude Delft Nv, July 8, 1969. This one explains the optical system (prisms, lenses, and so on) in a typical night vision device. US Patent 3,553,518: Image intensifiers for night vision by Pieter Schagen, Philips Corporation, January 5, 1971. 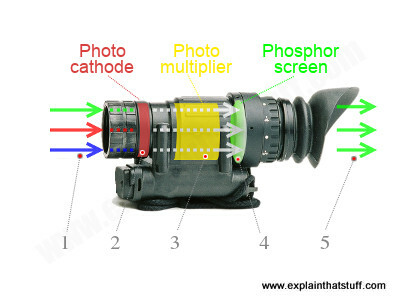 A brief but quite detailed explanation of electron multipliers and image intensifiers, and how phosphor colors are chosen to complement night-adapted vision. US Patent 4,463,252: Night vision goggle system by Thomas M. Brennan and Robert M. Burley, Baird Corporation, July 31, 1984. 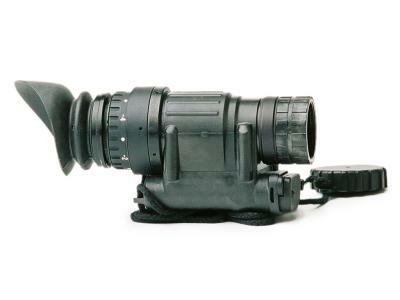 A typical modern night vision system. 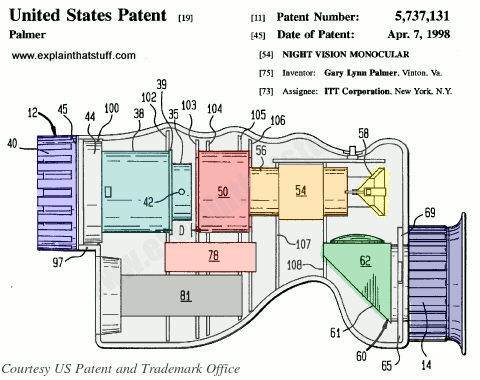 US Patent 5,737,131: Night vision monocular by Gary L. Palmer, ITT Corporation, April 7, 1998. A detailed technical description of a night vision scope similar to the PVS-14 Land Warrior shown in the photos above. 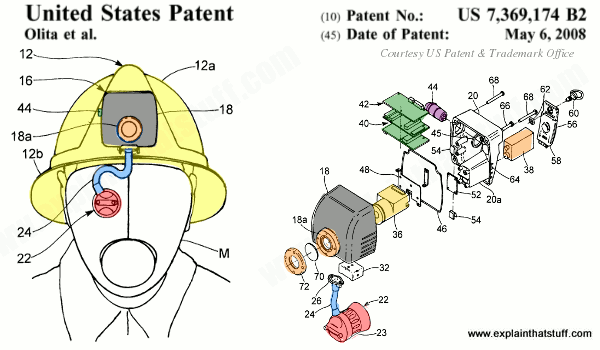 US Patent 7,369,174: Helmet-mounted thermal imaging system by Jules Olita et al, Sage Technologies, May 6, 2008. 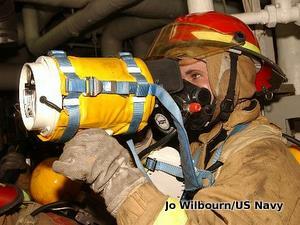 A monocular thermal camera built into a rescue worker's helmet. US Patent 3,723,642: Thermal imaging system by Peter Laakmanm, Hughes Aircraft, March 27, 1973. A general outline of a thermal imaging system that scans and produces a picture like a conventional, cathode-ray television.